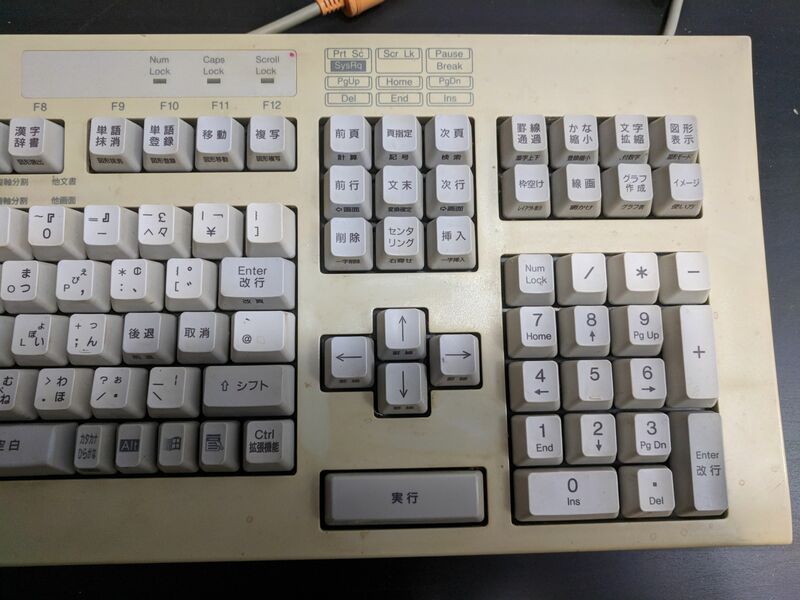 Purchased this from Yahoo Japan auctions and actually typing on it to post this. 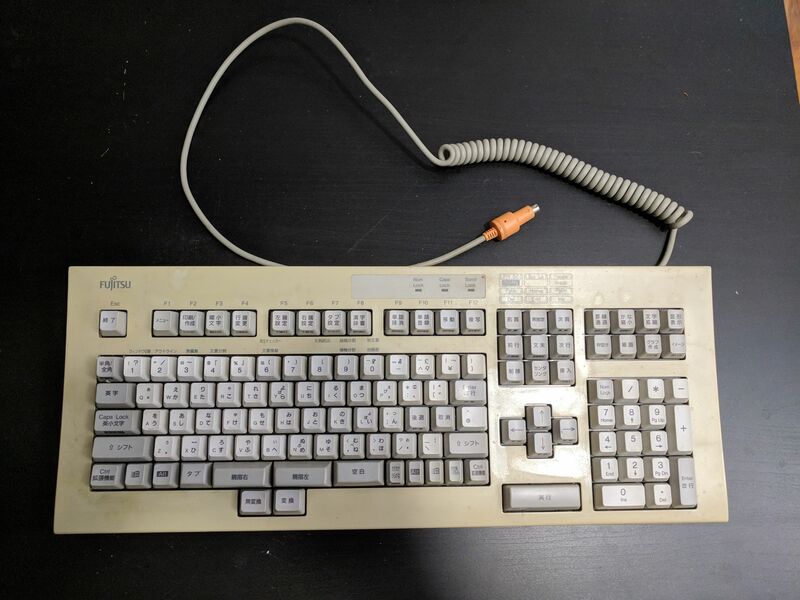 I'm fairly new keyboards as a hobby, and even newer to vintage boards, so this won't be a super detailed post. It uses the linear Fujitsu Leaf Spring switches, which feel like nothing I've typed on before. I'm just glad it works without any software, which I saw somewhere was recommended/necessary for it, though the layout hinders it a bit. Anywho, here are pics! 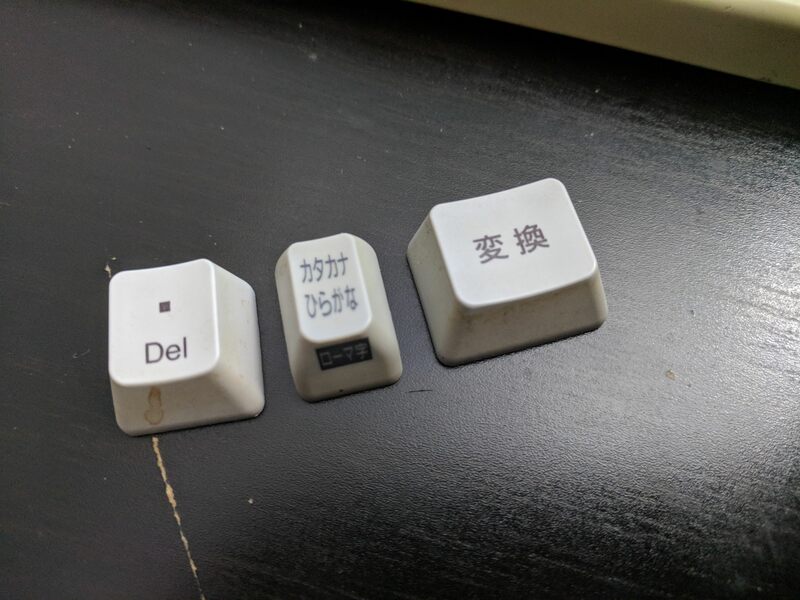 The super squished keys at the bottom, what switches do those use? Maybe the leaf springs face downwards to pack them in. I pried off the keycaps and it seems like the same switches! 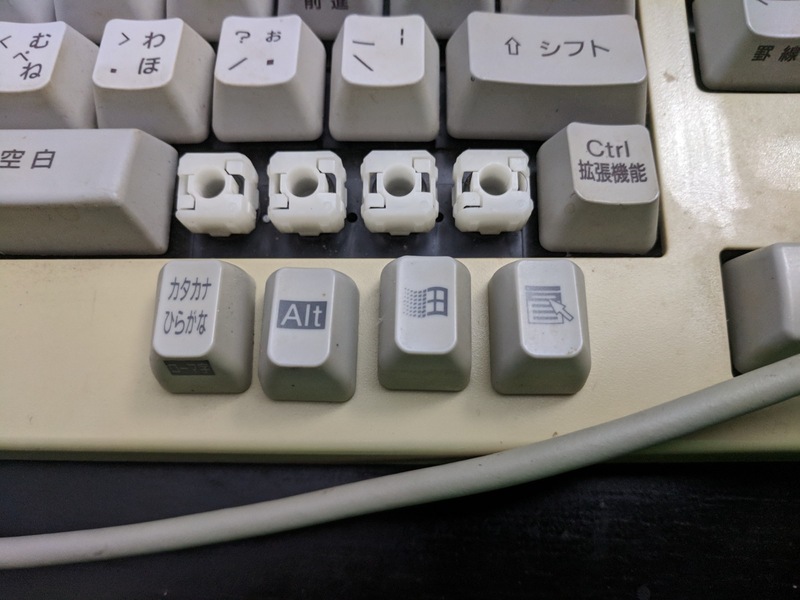 It's a nice linear feel to type on, though what I think is another enter type key below the arrows is a bit squeaky. The board is interesting, but I'm not sure if I want to keep it. I'd probably sell but I sort of want Chyros to have a crack at it first in a review. I dunno. I'm surprised that you can pack those sliders in so tightly. 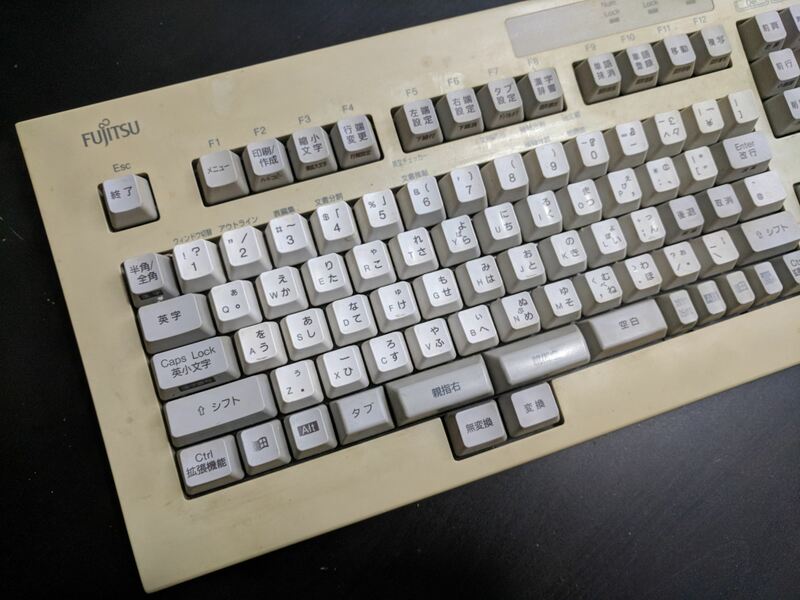 Interesting (assuming they are from the auction I looked at,) the seller said they were clicky, which went against everything on the net; I think there was a bit of a language barrier tbh. 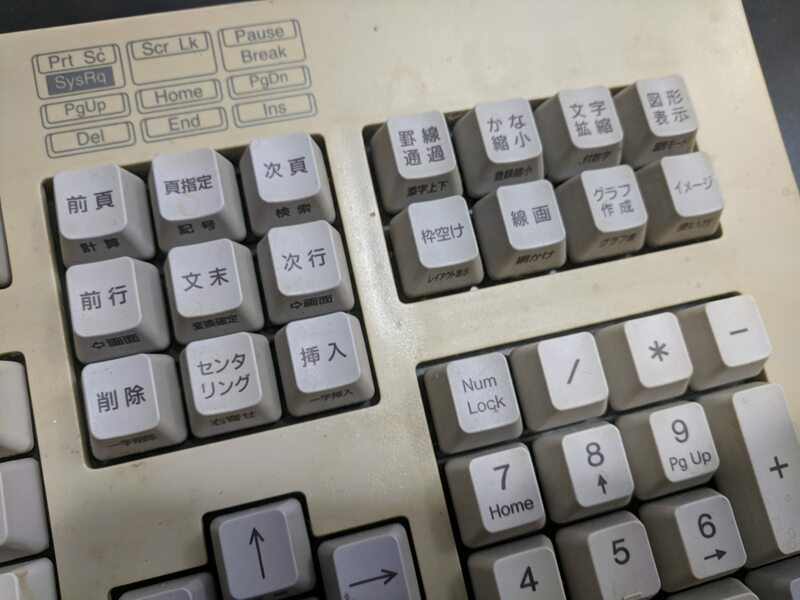 From my understanding, the software is only necessary if you want to use Japanese input or program the function keys. I found a version that seemed to install ok on my w10 box, but didn't have a board to test it with. 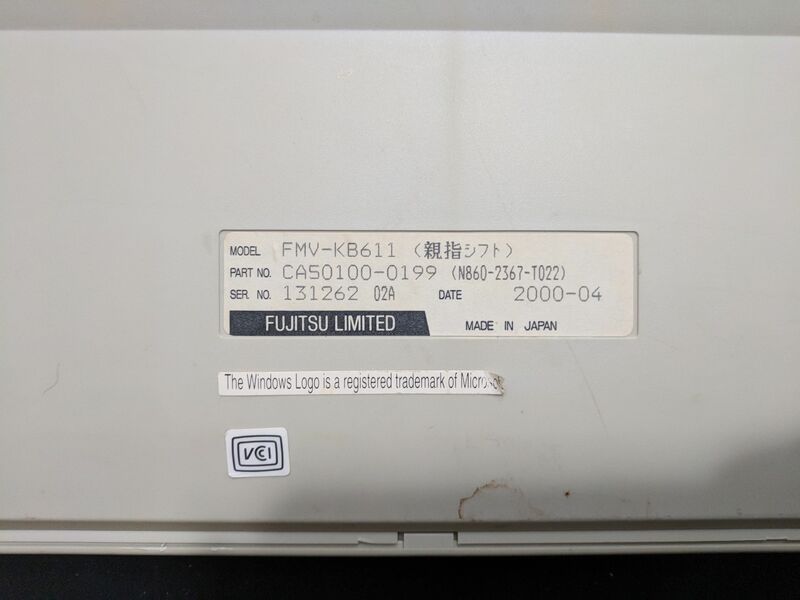 I'm really glad someone here picked the board up; I just couldn't afford it at the time, but these are about the only FLS boards that come up occasionally, so it's really good to get more info on them. FLS will have to remain on my todo list a bit longer, but one day, one day I tell you... Plus, the layout is just so cool! 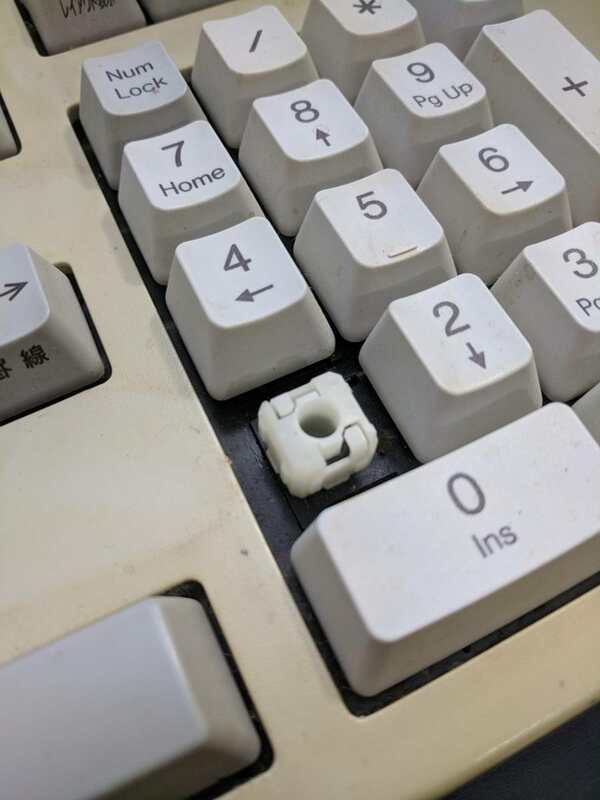 What is the keycap construction like? Yeah, definitely linear from the feel. The layout is really cool looking though. My favorite part of the board has to be the placement of the lock light indicators and nav cluster. Makes it seem very business like to me. I'm no expert on keyboard parts or construction (again, why I feel someone should take the board off my hands ) but they're fairly smooth and thick. 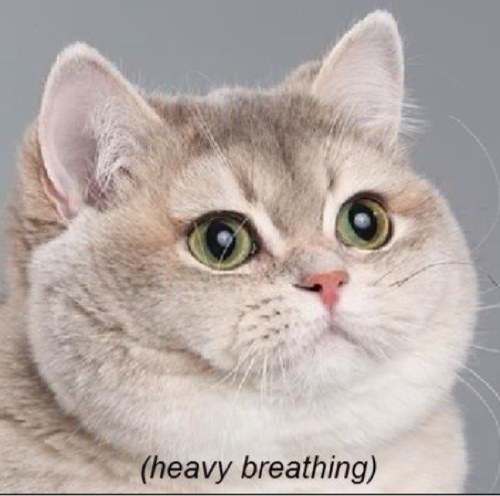 The spacebar and other rounded keys are even smoother. 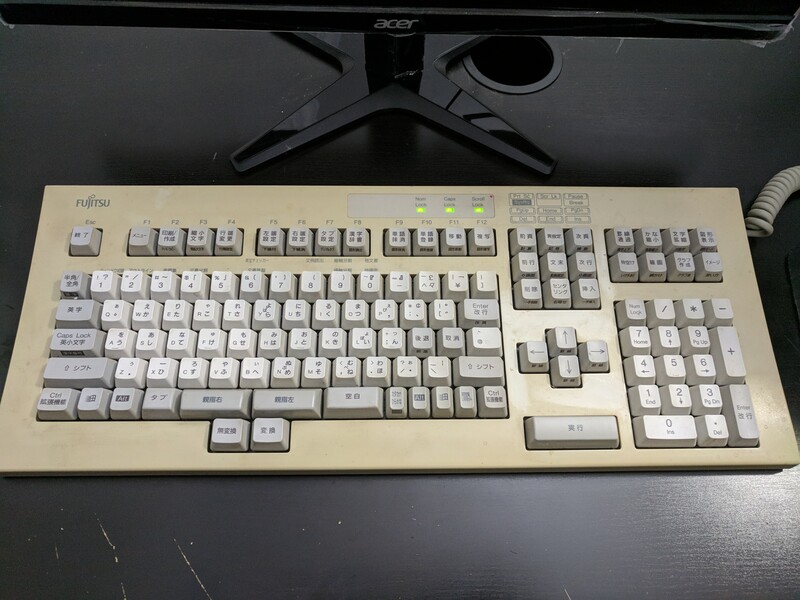 They're kind of comparable to the texture of my Model M's keycaps, so they might be PBT. The inside has these really interesting looking ridges, and on the larger caps there's divisions that seem to separate the switch from the sides of the keycap. I'm bad at describing things so here's the pics. Decent thickness, definitely PBT as they haven't yellowed with the board, I think dye sub or pad print? Not sure about the second part, tbh. 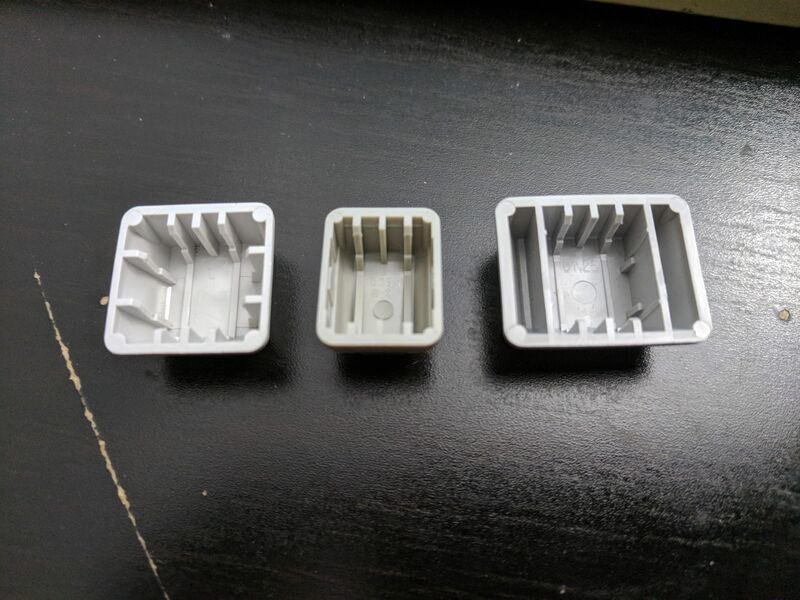 because they are essentially shells, you could 3D print adapters for any other mount and clip them around the outside IBM buckling spring style. Put the keyboard up for sale due to not having much use for me! consolation wrote: ↑ these are about the only FLS boards that come up occasionally, so it's really good to get more info on them. 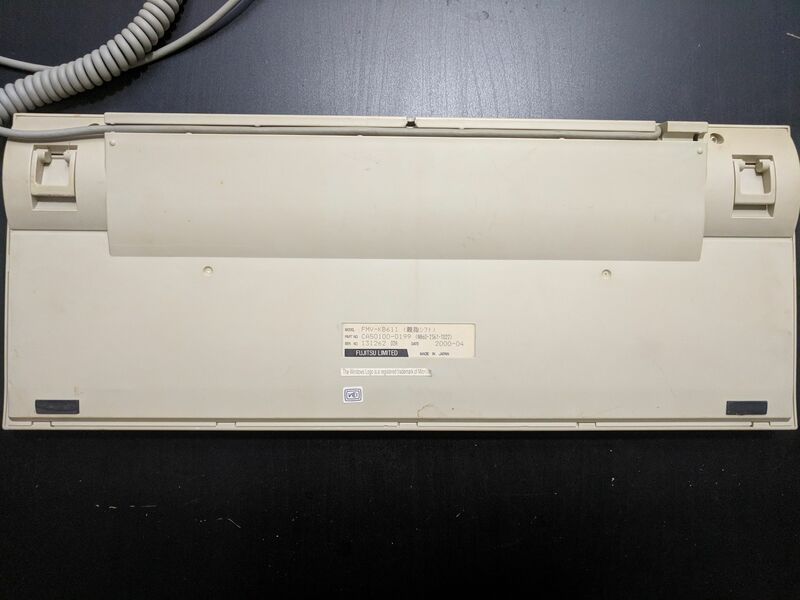 Fujitsu leaf springs are fairly common in Japan, certainly far more common that Cherry or Alps. 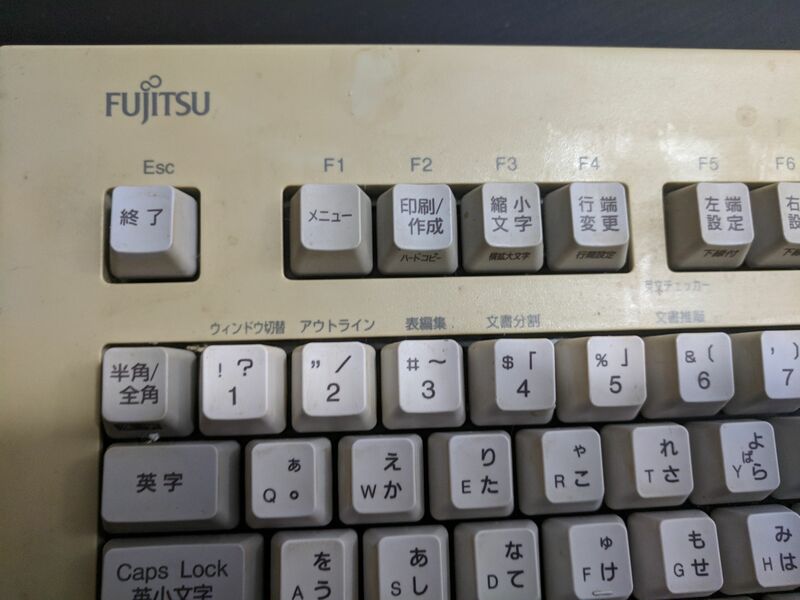 NEC oval switches are probably relatively numerous as well, but I'd wager that Fujitsu are just as common. 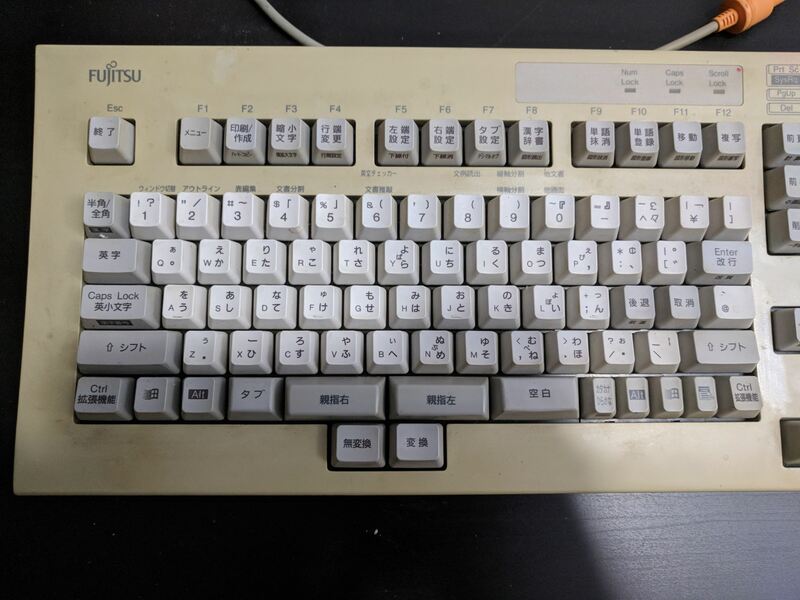 Almost every FM Towns keyboard uses them as do almost all of Fujitsu's other vintage boards. Of course, Peerless pop up too and they are awful, but they seem to be a natural evolution of the leaf spring switch considering its design. ...not like I am a massive fan of Futjitstu leaf springs, but boy is that nice looking. And now I've got it! Man the switches on this thing are so smooth it's unreal. Also sounds really nice too. I'm thinking about bringing it to work (if I can get used to it). I need something to make my time at the office a bit more interesting.